An impassioned appeal has been made for the driver involved in a hit and run incident which left a 28-year-old Banbridge dad for dead, to come forward. The incident which happened in the early hours of Friday, July 15 at North Commons, Carlingford, Co Louth has left Joseph McGivern in a critical condition at the Royal Victoria Hospital. Appealing on social media, family member Wendy Gracey called for anyone who knows anything about the incident to come forward. 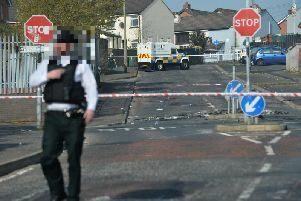 “On the main Carlingford to Newry road, a young Banbridge dad was hit by a car and left to die on the road where he was again ran over by another vehicle,” she said. “The young man is now in intensive care, having multiple surgeries for life changing injuries. “Do any Facebook users or any car body repair workers know of anyone who was in Carlingford on that night? Maybe at a social event who came home with damage to their vehicle, or have taken it to a body repair shop? Addressing the driver, Wendy continued: “When you hit Joseph and left him to die on the road did you think about him lying there? Wendy went on to appeal to the driver’s conscience by outlining the injuries he had sustained, including horrific leg and pelvis injuries, internal bleeding, a crushed chest and a broken back and neck. Wendy continued: “Joseph has a daughter of 22 months and a son at 10 weeks old but he isn’t like you because he can’t work now to provide for his family. Meanwhile Gardaí at Carlingford have said they are investigating the incident which occurred at approximately 3.50 am.